Book your transfer with Here To There Coaches on our Airport Shuttle Bus service today! At Here To There Coaches our Airport Shuttle Bus service is available for transfers between Sydney Airport, and 446 locations across Australia. The Airport Shuttle Bus service aboard Here To There Coaches is an affordable on-demand door-to-door shuttle service. Your vehicle will be shared with others and will make stops for passengers travelling nearby. Your pick-up and travel time is flexible and will be adjusted to suit all passengers travelling together while making sure everyone gets to their destination on time. 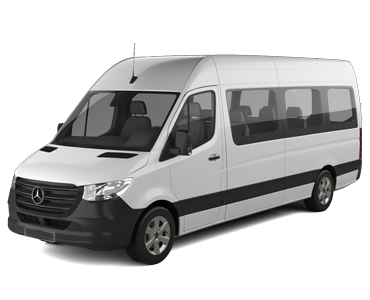 Our Airport Shuttle Bus service is available 24 hours a day 7 days a week and can be booked up to 3 days ahead of travel. At Here To There Coaches we offer fixed transfer fares starting from $131.10 AUD total one-way and with enough seat capacity for up to 20 passengers. Your final fare with us includes luggage allowance for 1 carry-on bag and 1 check-in bag per passenger. Also included in all our fares are airport parking fees, any tolls along the route and your drivers waiting time. Here To There Coaches is a transport company based in Australia and we have been a professional transport supplier on Jayride since April 2014. Here to There Coaches is a young but thriving business, with staff experienced in making your journey trouble free, comfortable and affordable. We understand that there is a need for a reliable, dedicated, secure and customer focused people transport solution, and we have staff with the experience and knowledge to make that happen for you, every time. With a background in a range of transportation services and security risk management, and staff with a long history of customer service, focused on satisfaction, you can be sure that Here To There Coaches is the right choice, when it comes to transporting yourself, your guests, or your valuable clients. Driver was very good and was on time so didn’t have to wait. He also help me to push my trolley at the airport. Very nice person. I would recommend this service to everyone. Ivan was great & helpful as usual. Easy to coordinate with company . Will always use and recommend them. The driver was punctual & communicated effectively where to proceed to meet him. The ride was smooth & quick. It was prefect. The driver was on time, polite and helpful. I will use this service again.